[Markus] had a TI MSP430 sitting around from the LaunchPad kit he bought a while back. He didn’t know what to do with it, but eventually decided that it would make a great miniature alarm clock. He added a shift register to the mix in order to drive his 7-segment LCD display, using two of the MSP430’s output pins in the process. Four more pins were tied to the display’s cathodes, while the remaining two pins are connected to push buttons which register user input. He crammed the clock’s logic as well as an alarm tune into the chip’s scant 2KB of memory space, literally occupying everything up to the last available byte. The clock is quite a power-miser, using just 2 µA in standby mode. According to [Markus’] calculations, that should enable the clock to use one set of batteries for 10+ years. 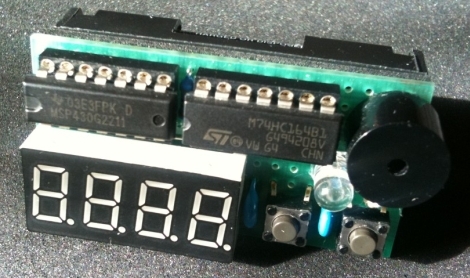 While this isn’t the first MSP430 clock we have seen, it certainly is the smallest and most simple. Stick around to see a quick video of his clock in action. Nice clean looking build. Love the simplicity. Nicely done, however, that would be “LED” not LCD. Just lighting the LED display for a few seconds a day would equate to the energy usage of an optimally built always-on LCD display. Is that supposed to wake someone up? It can barely be heard above the noise from the camera’s mic! Other than that, it looks very well made. Thanks for sharing, Markus. The lifetime problem isn’t the batteries, it’s the error in the clock source. What do you mean the clock source error? If the clock drifts that doesn’t affect energy consumption, just time accuracy. It’s actually a very interesting programming exercise to replicate the functions of an alarm clock: it is really not as easy as it seems. Could it be done with less components? Perhaps it might be one of the smaller home bench built electronic alarm clocks, but it would make at least two of the digital wrist watches that I had, that featured an alarm function. To be fair to Markus in his write up of the build he didn’t indicate building smallest or the most least power consuming alarm clock where goals.